Off to work: Apache attack helicopter Redhawk 65 from the RSAF's 120 Squadron taxis past an RSAF C-130H from 122 Squadron on Friday 7 Oct 2011. The RSAF detachment was noted practising for the First Frame for this year's Exercise Wallaby war games, held at the Australian Defence Force's Shoalwater Bay Training Area. Dependable: RSAF C-130H 733 from 122 Squadron prepares to unload passengers and cargo at Rockhampton Airport on Friday 7 Oct 2011. Note the long-range underwing fuel tanks, essential for the long flight over the great continent. Australian plane spotters who happen to be at Queensland's Rockhampton Airport at the right time continue to provide firsthand reports of the airhead for the Singapore Armed Forces' (SAF) Exercise Wallaby land warfare manoeuvres. 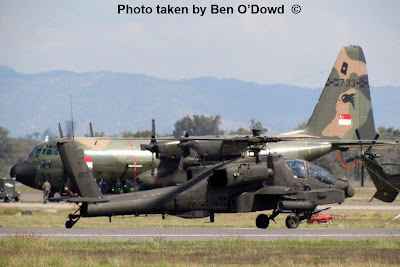 The Central Queensland Plane Spotting site provides images of Republic of Singapore Air Force 122 Squadron C-130H 733 touching down at Rocky along with pictures of 120 Squadron AH-64D Apache attack helicopters preparing for the First Frame of Exercise Wallaby. Please click here for more images taken on Friday 7 October 2011. 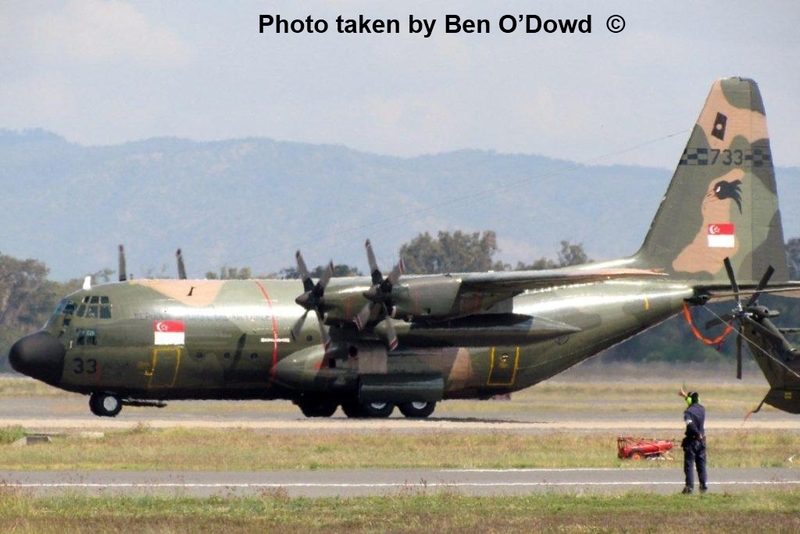 Meanwhile, additional Singapore Armed Forces (SAF) servicemen are understood to be preparing to depart for the Shoalwater Bay Training Area (SWBTA) next week aboard chartered Singapore Airlines flights. 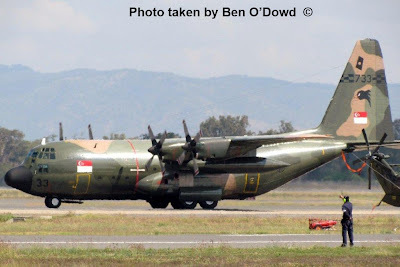 It is understood that these military charters typically push back from Changi Airport Terminal 3 in the early afternoon (around 1430 Hotel, Singapore time) and arrive in Rockhampton around midnight local time. Here are images of recent SQ charter flights seen upon arrival in Rockhampton. We thank the Australian military nuts for their vigilance. You guys might want to get those airband scanners out, mates. G'day all! Singapore Airlines charter flight SQ 8931 (9V-SQB) arrives at Rockhampton on Sunday 25 Sep 2011. Singapore Airlines charter flight SQ8931 (9V-SQE) unloads palletised cargo upon arrival from SIN on Tuesday 27 Sep 2011.